Learn about the Arts Commission's current and past neighborhood market partnerships. Discover where you can sell in San Francisco with an Art Vendor license. The Arts Commission partners with other city agencies, neighborhood groups, Community Business Districts, Community Benefit Districts, Cultural Districts, and other efforts for ongoing markets and onetime event partnerships. If you are looking for artists to activate your space or add to an event, please contact Anne Trickey, Program Officer at anne.trickey@sfgov.org or 415-252-2213. March through July 2018, artists are activating the War Memorial Veterans Building Lobby every second Friday of the month. Artists licensed in the program can sign up for the monthly lotteries to get a space. For more information, please contact Anne Trickey, Program Officer at anne.trickey@sfgov.org or 415-252-2213. The Artist Commission in partnership with the Ocean Avenue Association are activating Unity Plaza Thursday afternoons and some Saturdays through 2018. The Ocean Avenue Association's (OAA) mission is to promote our local businesses & ensure the district's welfare through safe & clean programming. For more information, please contact Anne Trickey, Program Officer at anne.trickey@sfgov.org or 415-252-2213. In addition to the partnerships listed above, artists licensed through the Arts Commission sell regularly at locations throughout the city. 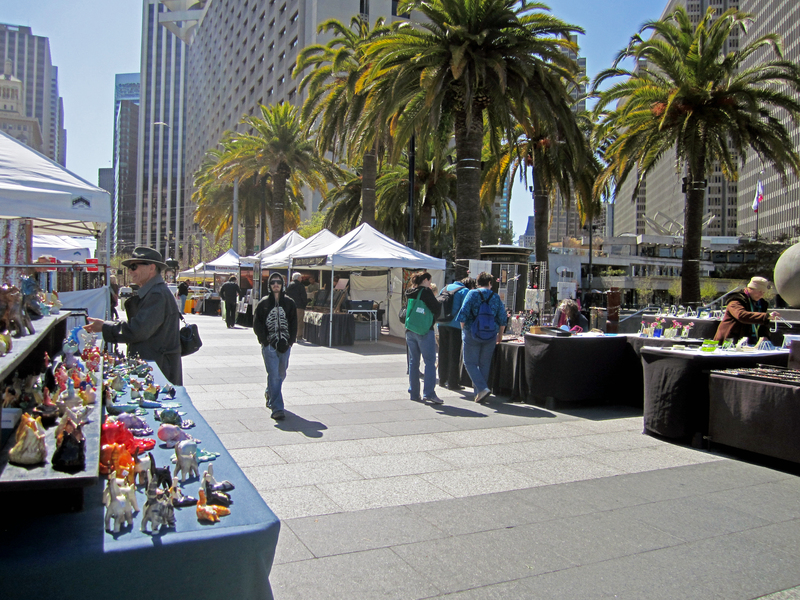 Embarcadero Plaza is the flagship location of the Art Vendor program. Artists have been selling here as part of the program since 1972. With the iconic backdrop of the San Francisco Ferry Building and a steady stream of Farmer’s Market attendees and tourists through the plaza, this is a favored location for artists. Art Vendor spaces line Beach Street and skip down Jefferson Street in the Fisherman’s Wharf neighborhood. Fun Sketchers and other artists selling one-of-a-kind San Francisco goods pepper the sidewalks. This location draws artists, tourists, and locals for its historical significance and amazing views of the bay. Scattered throughout the Financial District, Tenderloin, and Union Square neighborhoods, Art Vendor spaces activate areas such as Hallidie Plaza, and pop up on street corners to capitalize on are shoppers passing. Not all vendors in these areas are licensed by the Arts Commission, many have Peddlers Permits through the Police Department or other temporary selling permits. These locations are popular during the holiday season, when temporary locations become available from November through January. The Castro has only a few selling spaces which double during the holiday season. This area draws tourists as well as a local demographic. It is good during commute hours. The Cliff House has only three selling spaces with a dedicated set of artists who enjoy selling here on the weekend. Fewer local customers, but tourists and visitors walk up and down from the baths to the beach, giving artists here a steady stream of passers-by.